Visiting a night market in Bangkok is an absolute must-do while staying at the capital of Thailand. 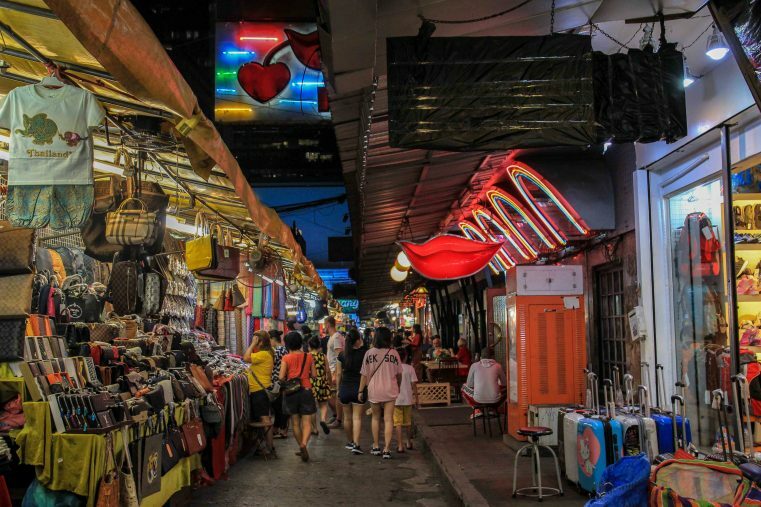 They are not only a social gathering place for locals and an important part of Thai culture, but also many of these night markets in Bangkok have now become real landmarks. Typical Thai street food, hipster & vintage markets, stylish clothes and handmade souvenirs as well as antiques – all that and many more highlights can be found in the markets of Bangkok city. The selection is huge and certainly, because of a limited amount of time, not all of these can be visited. So now you might ask yourself “which night market in Bangkok should I visit?” and where are the must-go markets? 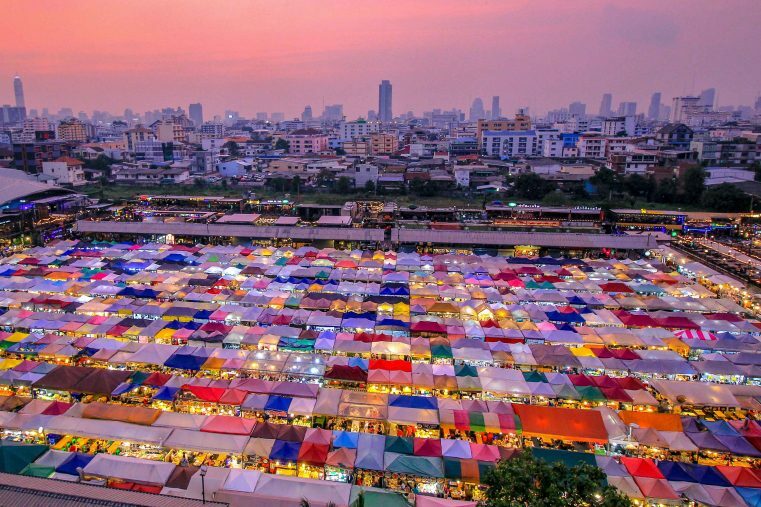 In this blog post we will show you a list of the best night markets of Bangkok and which are currently the most popular ones of2019! Additionally, you will get plenty of useful information about how to get there, opening hours, best places for shopping and good food. As a kind of shopping mall and night market mix, the Asiatique has nothing in common with a typical local Thai market. The location was artificially created only in 2012 and the pier and warehouses were modelled after ancient times. Nevertheless, it doesn`t mean that a visit is not less recommendable! The rather modern Bangkok night market is beautifully located right on the river and with a walk along the promenade you can enjoy a magnificent ambience. Inside the night market you will find plenty of street food and more than 40 restaurants from all over the world. Also, this night market is a fantastic place for shopping, finding great clothes and of course the popular Thailand souvenirs. The landmark of the market is the giant Ferris wheel, which offers a great view over Bangkok city. 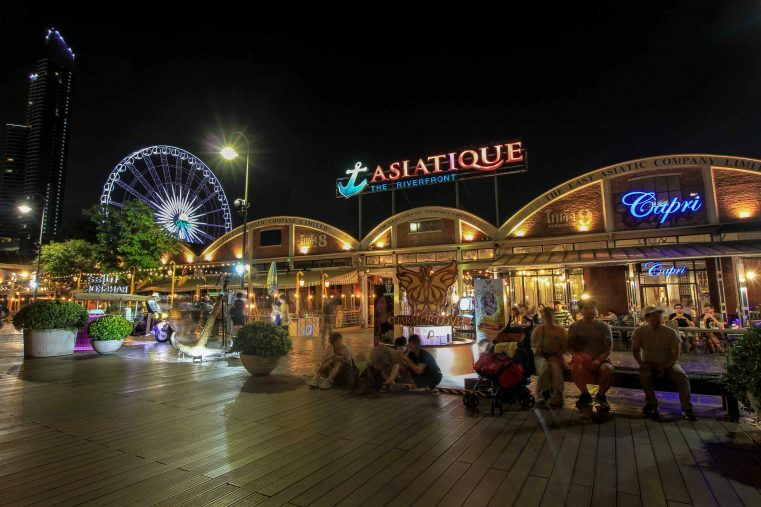 Opening times: The Asiatique opens its doors daily from 16:00 – 00:00 o’clock. How to get there: Skytrain (Silam Route) to Saphan Taksin Station and continue with the free shuttle boat to Asiatique the Riverfront. 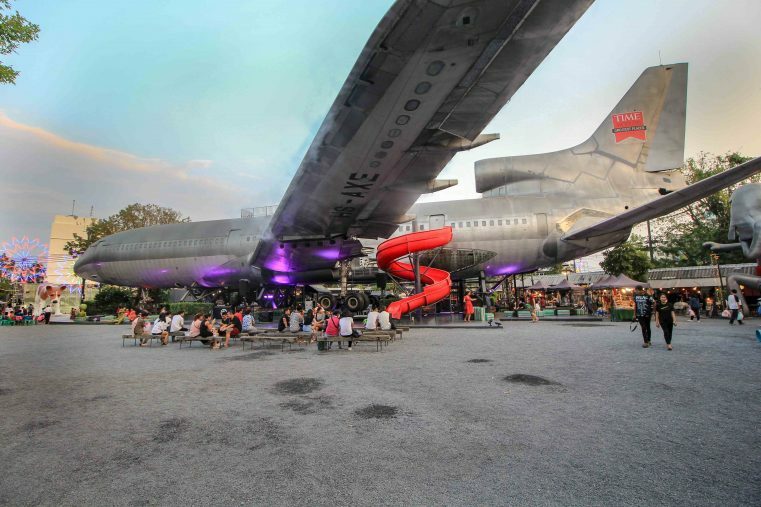 Those who love the extraordinary should definitely visit the Chang Chui night market. Here you can expect a lot of art, interesting galleries, retro design, vintage and hipster stuff but also some delicious street food places and very cool bars. A walk in the grounds will surprise you with huge sculptures and ingeniously creative stores made from recycled materials. The heart of the Chang Chui Plane Market is an old aeroplane standing in the middle of the night market. It is a real eye-catcher and a great place for taking night markets pictures. In the evening, the mainly young and stylish audience meets out in the Night zone, which serves delicious cocktails and various types of draft beer! Visitor don’t only come here for shopping – the unique location attracts the crowds and so you can spend a few pleasant hours just strolling around, eating good food and enjoying cool drinks. Tip: Although this night market in Bangkok is also open on weekdays, we still recommend a visit at weekend from 18:00, since then all shops and bars are open. Hours: From Monday to Sunday 11:00 – 23:00 o´clock – closed on Wednesday! How to get there: The easiest way is to take a taxi to Chang Chui Plane Market. Another option is taking the bus 515 or bus 539. The Train Night Market Ratchada is just as you would imagine a night market and a must-go in Bangkok. Lots of bustle and hustle through the streets, incredibly choice of cheap Thai street food, loud music and a huge selection of stalls and shops. Here you will find really cool vintage clothing and retro things, but also hip fashion, accessories, bags and all kind of souvenirs. In addition to the eating mile there are countless delicious restaurants and the bar mile bait with great happy hour offers. The Ratchada Night Market is mainly popular for locals, but that does not mean that no tourists will mix with the audience. Don`t search for a train: The Train Market takes its name from the former train market, which has been closed for some time now. Opening Hours: The Train Night Market Ratchada is open daily (weekend and weekdays) from 17:00 to 01:00. How to get there: Take the MRT to Thailand Cultural Center. Srinakarin’s Rod Fai Night Market is actually the big brother of the Train Night Market Ratchada and is known for being one of the biggest night markets in Bangkok. The entire market area is much larger and also the shopping possibilities are a bit better than in the Ratchada market. The only drawback is that this night market is a bit away from the path and you need long for getting there. Here you will find a lot of rarities, vintage cars and cool retro clothes but also good food and some bars. We recommend planning a visit to this night market on the weekend. A great place for all, who are looking for really unusual things to buy. Opening Hours: The Rod Fai Night Market is open Thursday through Sunday from 17:00 to 01:00. How to get there: By taxi to Srinakarin Soi 51, just behind the Seacon Square shopping center. Everyone knows the legendary Khao San Road: Backpackers settlement, nightlife district and night market all in one. The opinions about that place are quite different. It can be placed somewhere between “absolute tourist stupidity” and “a must see”. One thing is clear, this street is the most famous in town. After sunset, it gets really busy and and a tourist’s heart will find almost everything it desires. Fried insects, scorpionfish on spit, alcohol buckets, beer stalls, countless bars, restaurants, street food and somewhere in between foot massage parlours and souvenir stalls. The Khao San has a buzzing nightlife and backpackers, vacationers as well as locals mingling in the crowd every night. Loud music is played on every corner, and the later the night, the better the mood. There is always something going on at Khao San Road, you can see a lot, eat deliciously, shop or just have a drink and have a great evening out. Opening Hours: Every day as soon as the evening starts. Directions: If you do not live directly in the immediate vicinity of the Khao San Road, it is advisable to get there by taxi. 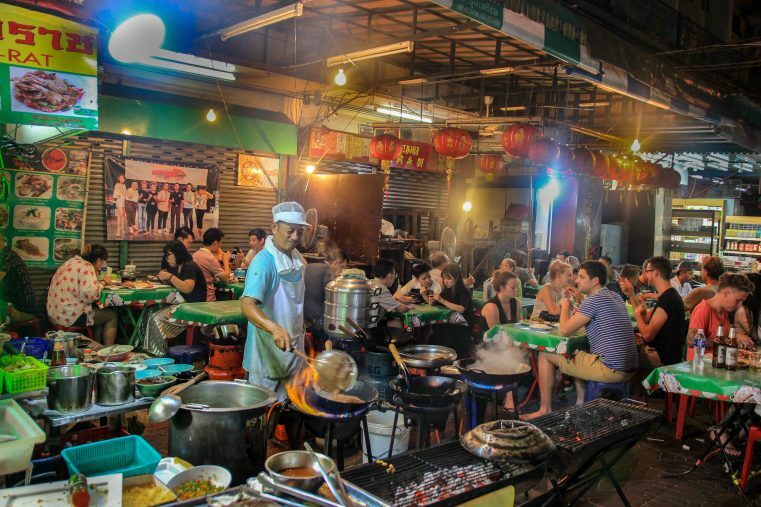 When visiting Yaowarat Road in Chinatown after sunset, the road turns into a night market cooking street food like no other. Chefs cook in front of their customers and create amazing meals. Many of these exotic foods have never been seen before, and brave ones can taste their way through the food stalls. There are many yummy fruits, fresh juices, but also a variety of seafood and other, often unknown and rare Chinese delicacies. If you are up to try insects, sure you will might find this “delicacies” at this night market. The whole atmosphere is really unique and walking through this night market is an awesome experience. All the new scents, the hustle and bustle and the brightly lit billboards, which are already a real landmark of Chinatown, impress immensely. All in all, the Chinatown Night Market is an absolutely must see in Bangkok. How to get there: The nearest MRT station is Hua Lamphong. From there it takes about 15 minutes to walk to Yaowarat Road. Many already know the huge Chatuchak Weekend Market, which opens every Saturday and Sunday. However, did you know that every Friday there is a night market scheduled? 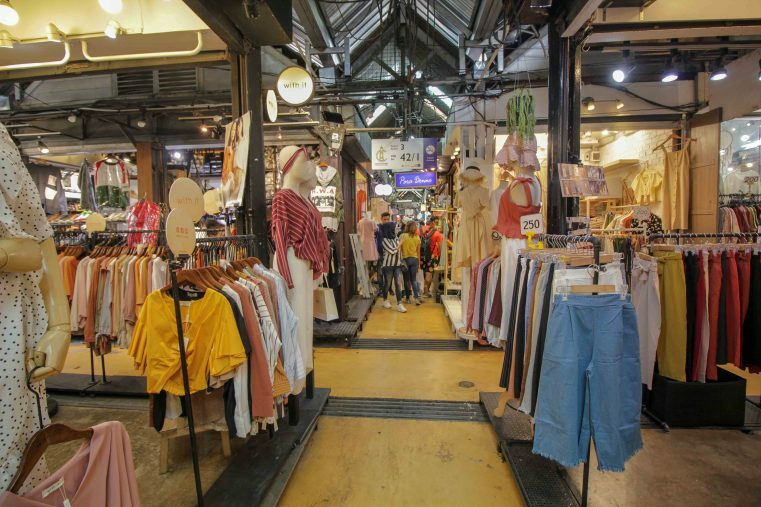 Especially bargain hunters love the Chatuchak Friday Night market, as there are the products slightly cheaper than at the Chatuchak weekend market. This night market mainly sells clothing, vintage fashion, shoes, handbags and accessories. It opens quite late and starting from 22:00 clock it gets really crowded. Because the shops close at 3:00 in the morning, this Friday Night Market is the perfect place for late night shopping in Bangkok! Nevertheless, we also recommend visiting the Weekend Market at Chatuchak! 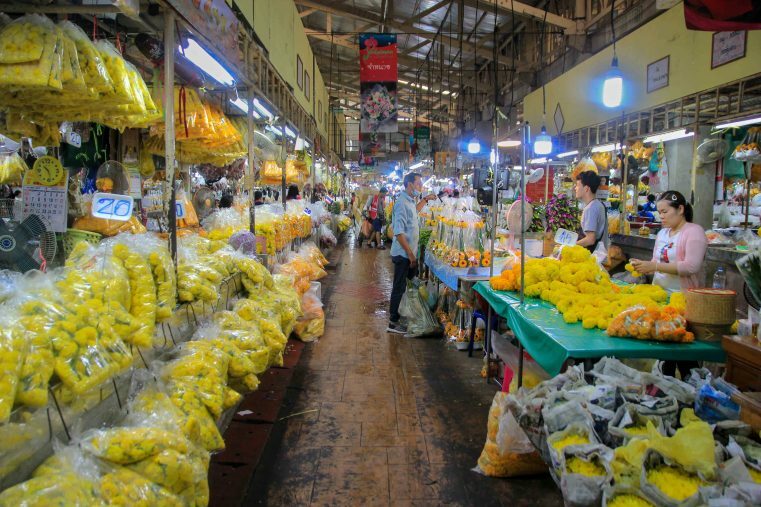 Another great market experience is a visit to the Flower Market in Bangkok. It is not only a night market, it can be visited at any time of the day as well. This night market is located directly on the river and was in older times, probably because of its location, used as a fish market. Today, fresh flowers from all over the country are traded here. Countless colorful bouquets and temple gifts are braided inside the huge market halls. In addition, you will find numerous shops with exotic and fragrant flower bouquets in all variety of colors. In addition to the uncountable beautiful flowers, also the fruit and vegetable market is really worth a visit. Visiting this Bangkok Night Market is a fantastic opportunity to admire the colorful flowers and explore exotic fruits from Thailand. Opening Hours: The Flower Market in Bangkok is open for 24 hours. How to get there: Easy to reach by taxi or boat to Memorial Bridge or Yodpiman. Patpong night market is located near BTS Station Sala Daeng and is probably one of Bangkok’s best-known night markets. It is located near Silom Road and it is easily accessible by BTS or taxi. Bargain hunters beware: Here you will find everything that is fake! If you are looking for plagiarism, here is the place to go. Mainly they sell fake watches, T-shirts, sunglasses and handbags. All mixed with the usual tourist souvenir stuff. Although you can get some good deals here, haggling is a must do. 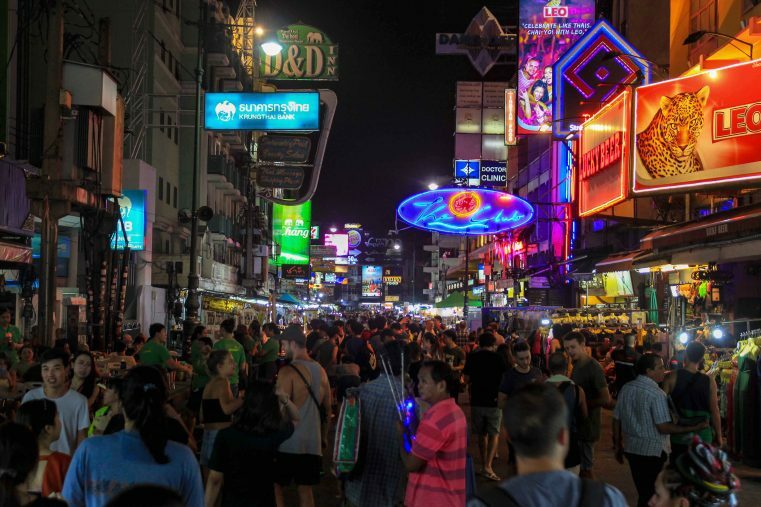 Patpong is not only a night market, it is also a popular nightlife area. In addition to a handful of GoGo bars you will find some restaurants and pubs, from where you can watch what’s going on. Patpong is one of the best-known night markets in Bangkok and a short trip can be quite interesting. Hours: The Patpong Night Market is open daily from Monday to Sunday from 17:00 to 0:00.